You’ve been running on coffee from project to project, putting out fires and tackling each task as it pops up. Now it’s time to ideate as your next deadline looms. You sit down, try to focus, and . . . nothing. Sound familiar? Enter the wonderful world of brainstorming! A term coined by ad executive Alex Osborn in the 1950s, brainstorming began as a few simple steps and has grown into a wide array of methods to choose from. If you’re stuck on your latest project or a business problem, learn how to brainstorm through five effective methods. Osborn outlined these steps to boost creativity, especially while brainstorming within groups. He found that the process removed inhibitions people can have about sharing ideas among their peers. The term brainstorming can conjure a grade-school vision of a classroom full of students shouting out different ideas all at once, but it’s matriculated from the days of chalkboard chatter to influencing business in the boardroom. Brainstorming has become an art and the key to not only mining new ideas but to crystallizing those ideas into actionable steps. Try one of these popular brainstorming methods the next time your idea tank is running on empty. Part of the challenge of brainstorming is trying to catch every idea swirling through the air. Mind maps are a creative, non-linear diagram used to capture that influx of ideas so you don’t miss anything. Start with a topic or question in the center of the mind map, and branch off to include every participant’s thoughts. To create your own mind map online, click the template below or browse through our gallery of additional mind map templates. 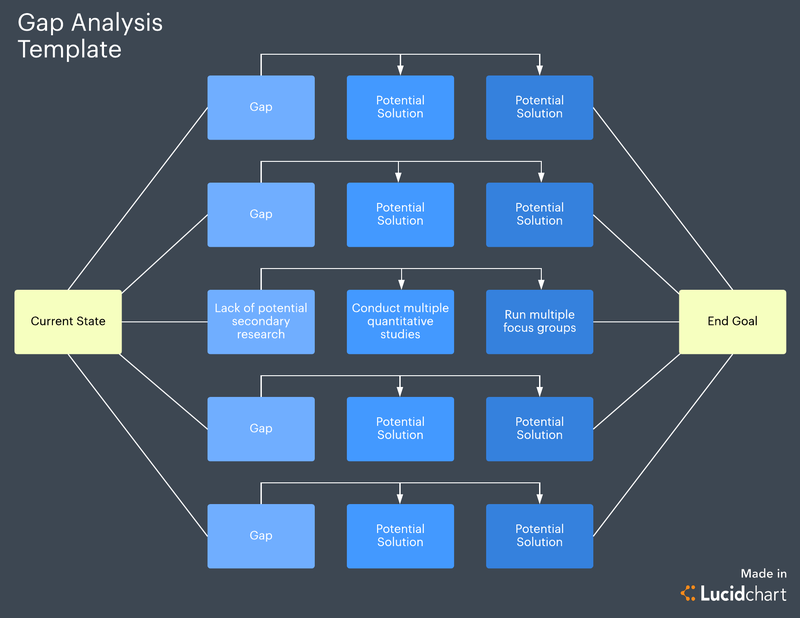 Gap analysis is especially helpful when it comes to problem solving because it requires you to find workable solutions. 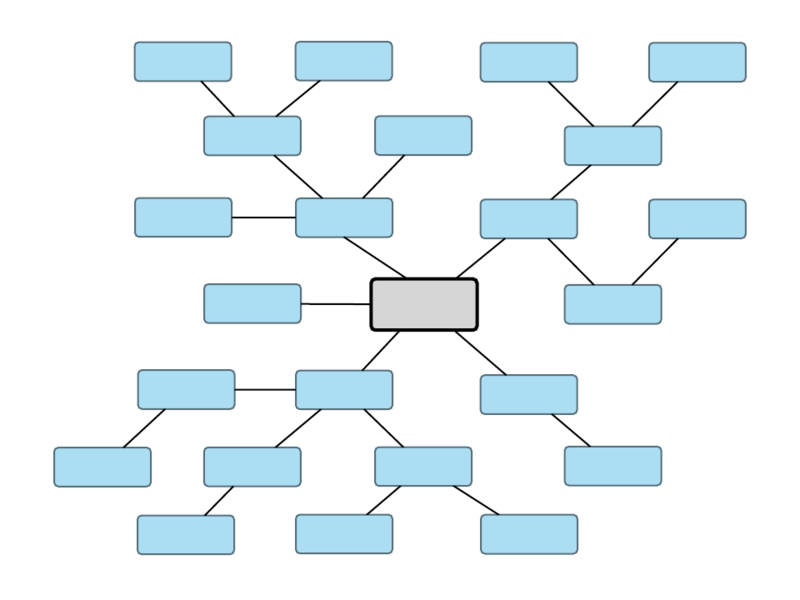 Flowcharts or mind maps can help you grid out your gap analysis. Strengths: How does the product, project, or business dominate and stand out from its competitors? Weaknesses: What are the flaws that can hurt or put the product, project, or business in jeopardy? Opportunities: What opportunities could the business capitalize on? Threats: What are the possible downfalls lurking for the product, project, or business? In Lucidchart, you and your colleagues can contribute to the same document and perform your SWOT analysis together. 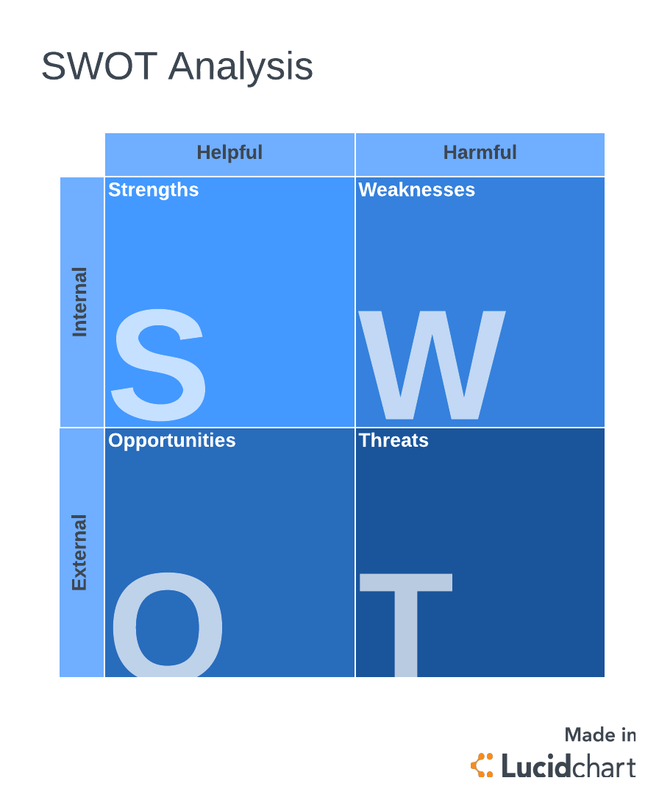 Get started with the SWOT analysis diagram below. Truth be told, that toddler is onto something. Created by Taiichi Ohno, the 5 Whys were made popular at Toyota as a standard process for root cause analysis—getting to the heart of a problem. Less structured than other more traditional problem-solving methods, the 5 Whys is simply what it sounds like: asking why over and over to get to the root of an obstacle or setback. This technique encourages an open dialogue that can trigger new ideas about a problem, whether done individually or with a group. Each why piggybacks off the answer to the previous why. 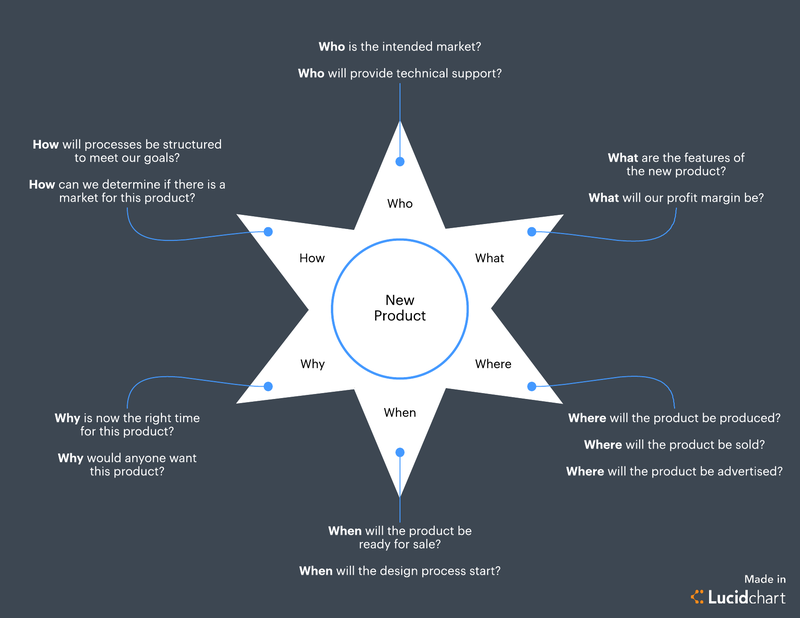 Both flowcharts and fishbone diagrams can help you track your answers to the 5 Whys. Take a look at this example, and then click to start your own diagram in Lucidchart. Like a reporter trying to discover the pivotal information to a story, the starbursting method of brainstorming requires you to think about the who, what, where, when, why, and how for any new idea. Place your main idea at the center of a star diagram, labeling each point of the star with those 5WH questions. Next, develop a series of questions about your idea for each point. Starbursting is popular among brainstorming methods because of its exploratory nature: one question triggers another question, and before you know it, you have the beginnings of a solid strategy within the answers to those questions. There’s no wrong way to brainstorm. Whether you are partial to lists or are more of a visual thinker, brainstorming becomes a seamless process to organize your thoughts in Lucidchart. Sign up for a free Lucidchart account today and take your brainstorming methods to a new level.